At last a true Picatinny spec scope mounting base for the TC Encore and Pro Hunter. 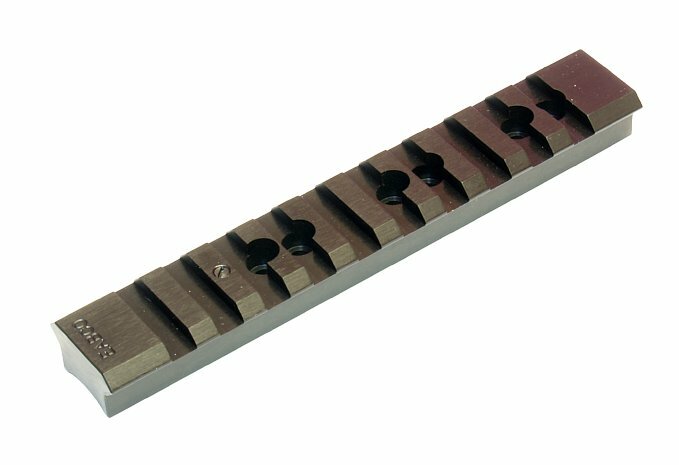 Based on our world famous, 6-Screw Keylock design, this scope base is precision machined for straightness and rigidity... The "must have" ingredients for accuracy and consistency. The slot widths, depths, and spacing conform strictly to Picatinny specifications so you can mount any Picatinny rings or accessories to your Encore or Pro Hunter. World famous for toughness, our Keylock bases have been made EVEN TOUGHER... The flat tops give full width slots for locking into rings with more surface area. Fits the standard 4-Screw T/C Encore Pro Hunter pre-tapped holes with the option of 6-Screw mounting for the hardest recoiling ammunition. Our price includes free 6-Screw installation when purchased with an Encore barrel. Installations are scheduled for Thursdays. Package Deal: Order with an EABCO Encore Accuracy Barrel or TC Encore Barrel and get $10 off, plus free installation! This is a high quality picatinny mount that perfectly fit the mounting holes of my 20 inch TC encore pro-hunter 45-70 barrel. It has been holding up to the heavy recoil without moving. I only wish that the front part of the mount would follow the barrel taper instead of leaving an air gap between the bottom of the mount and the top of the barrel. - Fits standard 4-screw pre-tapped scope mounting holes on Thompson Center Encore, Pro Hunter, Omega, and Triumph. Optional drill and tap 6-screw installation included free when you send in your barrel or order a new barrel. - Fits Picatinny milspec rings and accessories plus most Weaver style rings.